I first heard of Nicole Chamberlain when a high school student of mine heard Railroaded and asked if we could play it in the flute choir at her school. I was enchanted by the music, and I had the opportunity to meet Nicole at a flute festival a few weeks later. She is an award-winning flutist and composer with a unique voice and a multitude of compositions available. At this summer’s NFA convention in Minneapolis, Nicole will speak on a panel called “Keeping Score: A Conversation about Commissioning New Works,” and several of her compositions will be performed. Tell us a little about your background and your education. I went to the University of Georgia where I got a bachelors degree in Music Composition and a bachelors degree in Digital Media, where I specialized in computer animation. My initial intention was to be an animator and compose my own soundtracks, however, life took a turn and I found that I enjoyed being a concert composer far more. Life took me further away from animation until I spent most of my years in corporate life as a web designer supporting my addiction to music. Eight years ago, I walked out of the corporate world and started life as a freelance musician. Yes, it was incredibly hard. I had a pretty cushy job with health insurance, matching 401k, annual company trips, wonderful people, and good, steady, reliable pay. I was taking a huge risk to leave that and asking my fiancé (now my husband) to take that risk with me. But two events let me know it was time to take the plunge. The company I worked for was bought by another company, and I was no longer working for the awesome people I loved so much, and the benefits were taking a hit, which made me unhappy. I realized I was actually happy after teaching lessons or getting time with fellow musicians. My now husband, Brian, also believed in me enough to utter the words, “Quit your job. Your happiness is worth more than the paycheck. We’ll figure it out.” That was the final push off the cliff I needed. Once I was on my own, I never wanted to go back. I’ve been out of it so long now, eight years, that I don’t think I could go back if I wanted to. I’m done with that life, and I couldn’t be happier. One thing I love about your music is not just that you use extended techniques, but how you use them. There never seems to be a gratuitous moment of technique for its own sake. Will you talk a bit about what attracted you to composition in the first place, and how you developed your voice as a composer? My main composition professor was Dr. William Davis, a well known bassoon player who specializes in performing extended techniques. He was integral in pushing me to try incorporating extended techniques, but only if they had a role in developing the music. During school, however, I was having a hard enough time just crafting a cohesive piece, and I didn’t feel comfortable enough in my own performance skills or composition skills to explore such possibilities. It wasn’t until much later when I was able to take that risk. A few years later, when I had graduated from UGA and left a job at a children’s multimedia company where I worked as a web animator and composer, I began expanding my horizons and shifting my focus back to the concert stage. About that time, Greg Patillo and Project Trio were really taking off and they visited Atlanta, giving a workshop on beatboxing. That helped me feel more comfortable in performing extended techniques. The music, however, was far too advanced for me. It seems the rep out there at the time was an all or nothing attitude, and I just wanted to dip my toe in. So I wrote Smorgasbord for solo flute/piccolo. It was enough for me to get started, and I had to think of how I was going to apply these techniques to fit my style. I was too square for jazz or hip hop, and I didn’t feel genuine composing anything incredibly avant garde. So here I am, in the middle. Taking outrageous techniques and fitting them into my middle-of-the road composing. What is your compositional process like, and what advice would you give to a composer just starting out? It’s total trial and error. It’s just me alone in a room. I do all of my composing while my husband is away at work. I put ideas on a page and live with them for a few days. Most of the time I can make it work, but sometimes it ends up in the can. My advice for composers just starting out is you’re going to write a lot of trash, but hang on to that trash for a few days. One day’s trash sometimes ferments into a better idea. I just compose a good bit, and then I take a step back and edit. Being comfortable with writing garbage is incredibly tough to do, but it’s all a process. Any artist’s work in progress looks like a hot mess. If you’ve ever watched a sculptor or painter work, you can see the process is messy and riddled with mistakes. Those mistakes can lead to other ideas and make you problem-solve into a better situation. Just keep going! Do you have any advice about teaching extended techniques to pre-college students? Are there any materials that you find to be particularly suitable for beginners? I spend a good part of my life as a flute teacher, teaching middle school kids up to adults. I’m a firm believer that extended techniques can serve many purposes in shaping a musician’s life. Sometimes, I have a student who is losing interest, for whom music is getting tedious. We whip out the extended techniques, and then we’re laughing and talking about using the air, face, and tongue in different ways. Most of the time a light bulb goes off, and they begin practicing again or overcoming restrictions in their face/lip flexibility. I’ve taken my workshop “Beatboxing to a Better Bach” to different colleges and festivals and we always have the best time while learning new ways to practice traditional music. It’s even made the hard-boiled critics of extended techniques open their minds a bit. As far as materials, there’s not much out there. I’ve been using my own teaching methods to teach them one on one. 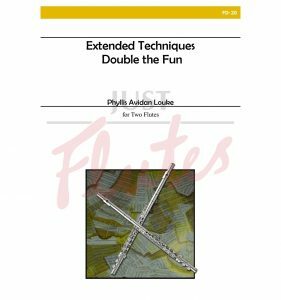 However, I have found some gems like Phyllis Louke’s “Extended Techniques: Double the Fun “. Each flute duet focuses on one extended technique. That’s usually how I introduce my students. I also refer them to Greg Patillo’s YouTube video that shows the basics of beatboxing. Then, the next step is for us to work on one of my pieces, like Crosswalk or Smorgasbord. As a group, I love to introduce my flute choir pieces Dizzy or Railroaded. They are written for people who are dipping their toes into extended techniques. Laughter always ensues. It seems that nearly every musician I know wears several hats: teacher, performer, administrator, composer, etc. How do you balance the different facets of your professional life? It’s less of a balancing act and more of an exercise in herding cats! I try to keep my Mondays free for planning, promotions, and getting ahead of emails. Mondays dictate how my week is going to play out. However, when I am on the road or having a hectic performance schedule (December-March), it gets challenging. I try to compose, play, and answer emails every day, even if it’s not for very long. I make a list of what needs to be accomplished for the week (hard deadlines – applications, commission deadlines, workout schedules, performances), and I make a list of things I would like to accomplish (finish a movement, work out a tough passage, update website, etc). When I write a list, things get done. I used to use a notebook, but I kept leaving the notebook behind when i needed it. Now I use the app Wunderlist on my computer and phone so that I can remember my plans when I am out and about. I also try to switch off my professional life. When I worked at an office, I could leave work (if I wasn’t babysitting the pager for when websites went down). Now that I work for myself, it’s incredibly hard to turn off. The best I can do, when I get home from teaching or rehearsals, is to plug in my phone in my office and then go downstairs to hang with the hubs and pups. The biggest thing I’m working on is an album of my flute music with flutists Dr. Mary Matthews and Matthew Angelo and pianist Jessica Nilles. We’re releasing it under the MSR Classics label and begin recording at the end of July. Right now, we are trying to fund this expensive endeavor through a GoFundMe Campaign. So you can pre order the CD with a donation HERE. I also won the NFA’s Flute Choir Composition Competition for my flute choir piece Chivy. It will be premiered by the NFA’s High School Flute choir, directed by Wendy Kumer. It will be published by my publishing company, Spotted Rocket Publishing, available for purchase in August. I will be at the NFA Convention in Minneapolis and hope to catch four performances of my pieces, and I will be on the Flute New Music Consortium‘s panel “Keeping Score: A Conversation about Commissioning New Works”. I’ll be wrapping up a commission about then and hope to network for other commissions. I just finished a commission for solo piccolo called Death Whistle for Dr. Elizabeth Robinson, and just put a new contract for my next commission with guitarist (can you believe it!?!) Brian Smith of the Georgia Guitar Quartet. He’s requested that it involve the music box that I used for my piccolo piece Lilliputian as well as using looping. I’m looking forward to getting out of my comfort zone and working with a talented college friend, whose wife, Natalie Smith, is also a good friend and an amazing flutist. Thanks for your time, Nicole! 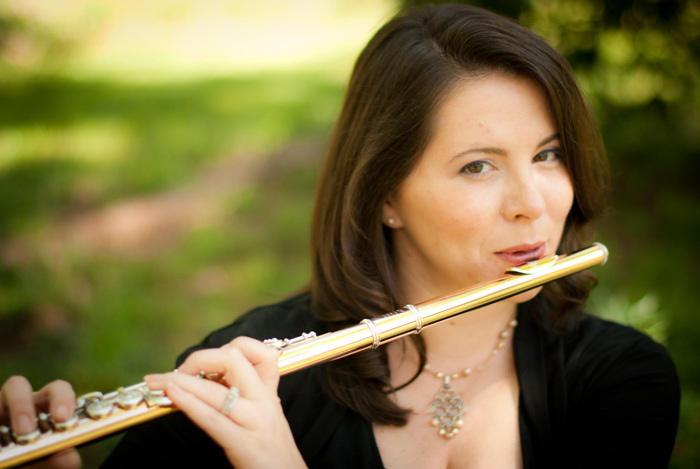 Nicole Chamberlain is a composer and flutist living in Atlanta, GA. In 2010, Nicole won “Audience Favorite” at the Atlanta Opera’s first 24-Hour Opera Project for her opera “Scrub-A-Dub Raw” which resulted in the the Atlanta Opera’s first ever commission of the children’s opera, “Rabbit Tales”, which received over 50 performances and kick-started her career as a composer. Nicole has also been commissioned by groups such as the Georgia Symphony Orchestra, Oklahoma Flute Society, Atlanta Flute Club, Flute Choir of Atlanta, Cuatro Puntos, Dahlia Flute Duo, Clibber the Jones Ensemble, and Hopewell Middle School Symphonic Band, among others. She has had works performed at the 2013, 2015, 2016, and 2017 National Flute Association Conventions. She also won the 2013 Areon Flutes International Composition Competition, 2nd place in the 2014 and 2016 Flute New Music Consortium, and 1st place in the 2015 The Flute View’s Composition Competition. Nicole received her Bachelors in Music Composition from the University of Georgia, where she studied with Dr. William Davis, Dr. Leonard Ball, Dr. Lewis Nielson and Dr. Roger Vogel and was selected for masterclasses with Charles Wuorinen and Joan Tower. As a flutist, Nicole has appeared with such groups as the Georgia Symphony Orchestra, the LaGrange Symphony, Gwinnett Ballet, duoATL, Mercury Season, Terminus Ensemble, Chamber Cartel, Perimeter Flutes, neoPhonia, Capitol City Opera, and Orchestra Atlanta. Nicole has participated in Masterclasses with Bradly Garner, Paul Edmund-Davies and Dr.Gordon Cole. Nicole’s former flute teachers have included Donna Orbavich (Hong Kong Symphony), Lisa Wienhold (Alabama Symphony), Dr. Ronald Waln (University of Georgia) and the Atlanta Symphony Orchestra’s principal flutist, Christina Smith.